Cardinals fans from around the Midwest and Mid-South regions got a treat this weekend has several current and former players came to their towns as apart of the organizations annual Cardinals Caravan. The Caravan came to Jonesboro, in Northeast Arkansas, on Monday and featured several treats for the kids. The event also served as a fund raising event for the city’s Miracle League, which is building a softball field and basketball court for children and adults with special needs. 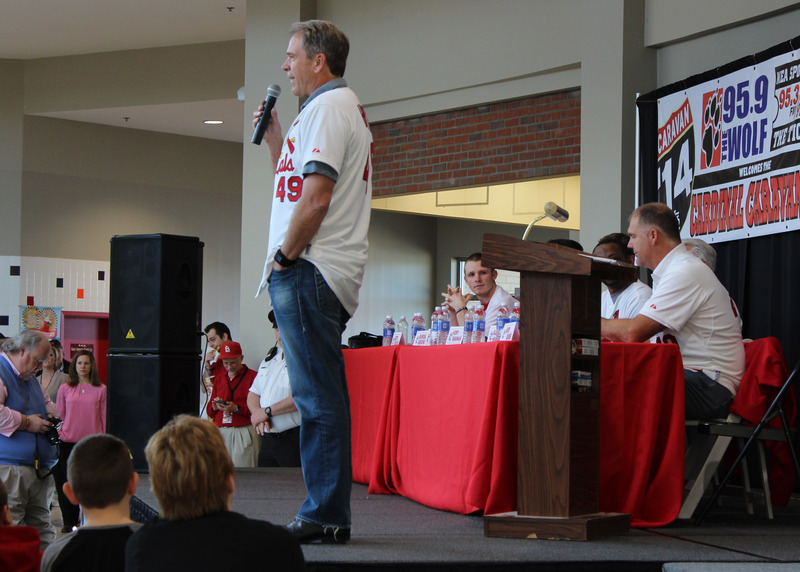 Ricky Horton served as emcee for the event which included Andy Benes, Al Hrabosky, Kerry Robinson, Seth Maness, Randal Grichuk and Keith Butler. * Why Shelby Miller didn’t pitch in the postseason. Benes’ guess? Match-ups didn’t work in Miller’s favor to pitch. * Benes also expressed appreciation to the city of Jonesboro, which is home to Arkansas State University. Benes’ son, Drew, played for the Red Wolves before being drafted by the Cardinals in 2010. Drew played for the O’Fallon, Mo.- based River City Rascals of the Independent League last summer. * Horton and Hrabosky both expect the 2014 edition of the St. Louis Cardinals to be better than the 2013 team. * Robinson discussed his role evaluating talent for the organization. * Grichuk played in Arkansas last summer as a member of the Anaheim Angels AA affiliate Arkansas Travelers in Little Rock. Grichuk and Peter Bourjos came to the Cardinals this off season in exchange for David Freese. Grichuk is looking forward to Spring Training and seeing what he can bring to the team. He did promise young fans that he is fast. * Maness and Butler played roles within the bullpen last season. Maness played a large role in setting up during the late innings. Both pitchers are looking forward to this spring to see how they will continue their roles with the team. 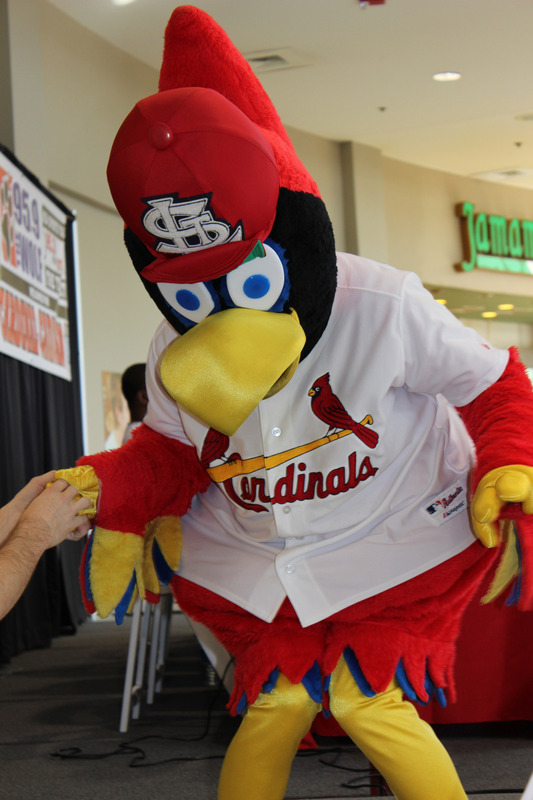 What visit wouldn’t be complete without Fredbird! 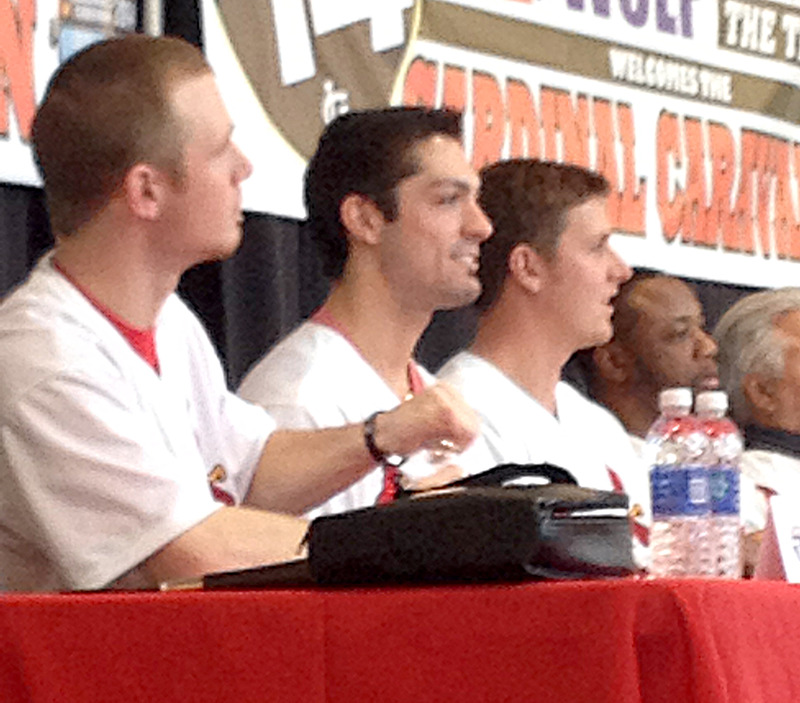 This entry was posted in 2014 Cardinals, General Cardinals and tagged Cardinals Caravan by Miranda. Bookmark the permalink.